One of my favorite comments from museum visitors is, “Who knew your little town had so much history!” The truth is Cannon Beach’s past might not be as lengthy as that of European towns or as rich as New York, but Cannon Beach can hold its own with tales of rum running, misused dynamite, and even eccentric British bachelors. Over the next few articles, I was hoping to focus on some of the true characters of Cannon Beach, some of whom were true remittance men. Due to British primogeniture law, daughters and second sons of the British aristocracy were unable to inherit. During the 1870’s these sons and daughters were often sent away, sometimes with a small lump sum of family heirlooms or funds. Some even received annual or monthly lump sums from their families. The remittance man (or woman) weren’t just sent away due to lack of inheritance, for some it was due to an unapproved marriage or to save the family from some kind of embarrassment. Joe Walsh in front of the Elk Creek Hotel. Many remittance men had never held a job and had little to no skill to speak of. They were often considered to be lazy drunken scoundrels. While Joe Walsh might have had some of these habits, the other remittance men in Cannon Beach were industrious to say the least. Walsh also helped Herbert Logan with his properties and was a ranchman at Seaside. 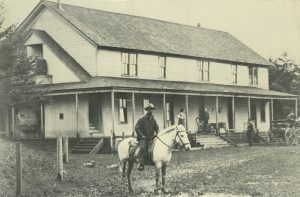 Herbert Logan built the Elk Creek Hotel, the first hotel in Cannon Beach, and campaigned the area as a sportsman’s paradise, perfect for rest and respite. He also purchased property in Seaside and managed the Elk Creek Toll Road – and so much more! Jack Astbury was a popular fellow in the area. He was an excellent dancer, very active in the community, was mannerly, and was an excellent county surveyor. Or at least, so the stories go. 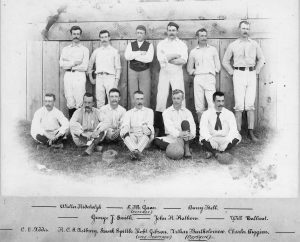 In 1895, Astbury was made captain of the Seaside cricket team. Robert (Jack) Astbury with the Astoria Football Club in 1894. The Astoria Football Club was one of the sponsors of the first Astoria Regatta. Astbury is seated, second from the left. As county surveyor, Astbury surveyed parts of Astoria, Seaside, Elk Creek Road and even the area south of Tillamook Head known as Elk Creek, now Cannon Beach. This plat map is currently on display at the museum in our exhibit, “The Long Road Home.” He conducted surveys during various years, but it seems as if the first survey he conducted was done in Seaside in 1896. He continued surveying the area until 1906, but by 1908, Astbury had moved to Gold Hill, Oregon and began growing apples. He never married and passed away peacefully in 1945. Other notable characters include Marmaduke Maxwell, Joe Walsh and James Jacob Mahar (also known as Jimmy the Tough.” Jimmy the Tough homesteaded north of Silver Point before 1894. The remittance men practice continued until WWI. Just a few years after World War I primogeniture law was abolished in England, in 1925 to be exact. The remittance men and women of Great Britain did not just end up in America, many were sent to New Zealand, Canada, Australia, and much farther. As one historian surmised, this probably helped spread the use of the English language. These men definitely had an impact on the character of Cannon Beach. They contributed substantially to the character of our community just by bringing a little bit of home with them through their construction, entrepreneurism and ideals. 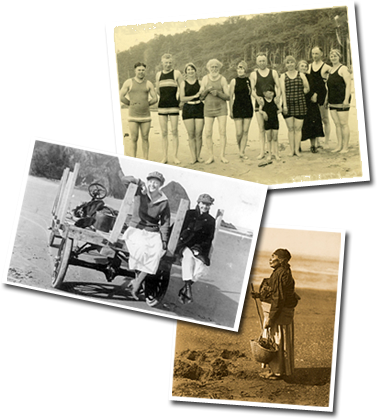 Cannon Beach has had a series of wonderful characters that have added to the charm of our small town; you’ll hear their stories over the next few articles. If you would like more information, the museum is home to an extensive oral history collection, over 12,000 historic documents and photos, and a great research library. The Cannon Beach History Center & Museum is open 11:00 until 4:00 p.m. Wednesday through Monday. Located at 1387 South Spruce Street, stop on by and see what we have! This article originally appeared in the January 26, 2018 issue of the Cannon Beach Gazette. Did you find this article helpful? Share it social networks by clicking on an icon below.